Additional Contributor: Abbé Alexis Rochon. And a Further Description of Madagascar by the Abbé Alexis Rochon; Edited with an Introduction and Notes by Capt. Pasfield Oliver, R.A., Author of "Madagascar"
Daniel Defoe is widely believed to have been ghostwriter of this work. 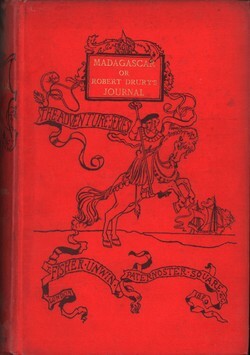 Many have considered it to be a work of fiction, but research has shown that Robert Drury did in fact exist and that the level of accurate detail about Madagascar in the book could not have been based on anything other than first-hand experience, suggesting that, for the mostpart at least, the story is factual. This edition is illustrated and edited with an introduction and notes by Capt. Pasfield Oliver R.A. It also contains a description of Madagascar by the Abbé Alexis Rochon, abridged from the English Version of 1792. This item was kindly donated to the Madagascar Library collection by David Purbrick.